Unprecedented momentum for resilience-building is shaping the way we conceive, plan and manage our cities. From local governments to global organizations, resilience is increasingly considered as an essential ingredient and partner to achieving and sustaining development gains. In addition to mapping the diverse landscape of actors working on urban resilience, the report bridges the gap between history, research and practice. 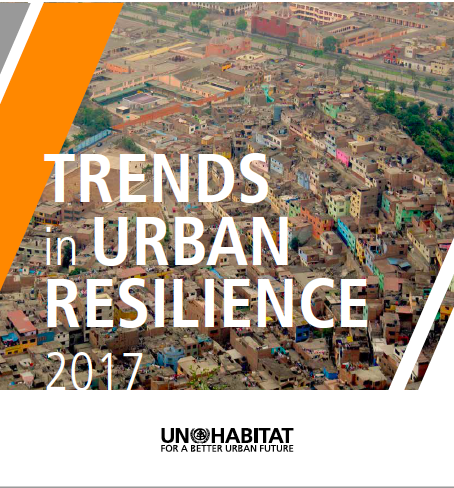 This is one of the first publications to take stock of urban resilience efforts globally under the framework of all 6 major inter-governmental agendas (New Urban Agenda, Sustainable Development Goals, Sendai Framework, Addis Ababa Action Agenda, Paris Agreement, Humanitarian Summit. Launched by Joan Clos, Executive Director of UN-Habitat, at the Global Platform for Disaster Risk Reduction unfolds in Cancun, Mexico, this leading-edge report comes at a pertinent time as diverse stakeholders come together to review progress on the Sendai Framework. Documenting geographically diverse case studies from cities in the Ecuador, Italy, Japan, Kiribati islands, Russian Federation, Somalia, South Africa, USA the publication captures innovative practices adopted at the local level to ensure wellbeing and reduce risk to hazards in support of urban life. The publication was launched at the Global Platform for Disaster Risk Reduction in Cancun, Mexico during the Local Government Summit.